If you create work in editions, you may easily track the editions in ARTsala and use the editions feature to make it easier to record each individual piece from an edition. Creating an edition is a lot like creating a new piece of artwork. First, click on the editions block on your Account Control Page. You will see an alphabetical list of all of your editions. To add a new edition, click on the "Add a New Edition" link at the top of the page. Now, fill in the edition information as if you were entering an individual piece of art (see our Adding Art Guide if you need help). 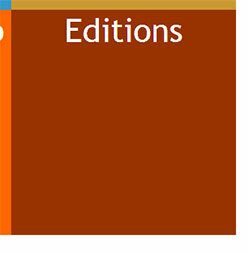 When you are finished entering the information about the edition, you may save the information for future use, or you may immediately add one of the edition to inventory. 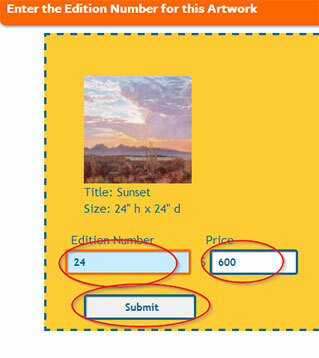 If you choose to add one to inventory, you will be asked which number of the edition you are adding, and the price for the piece. ARTsala will add the edition to inventory and fill in all of the information about the piece for you. You may confirm the information, edit the information, and save the inventory record. To add a new piece to the eddition, return to your editions page and click on the "Add one to Inventory" link next to the piece you wish to add.